A/N: This is my very first attempt at partially drawing anything. I apologize in advance for not being able to make Neal look more like Neal, but like I said - first time!!! \o/ :D I am most definitely looking forward to using this combo of techniques in my future projects, it's a lot of fun... even though it is also extremely time-consuming. You are so wonderfully talented and Neal certainly DOES look like Neal. Wow! I agree with Elr--you're so very talented, and Neal looks great. I love the look on his face as he's listening to the music. Oh wow, how awesome!!! Of course it's Neal!!!! You never cease to amaze me, always doing something different and with such eye for the detail. This is amazing, Olena! 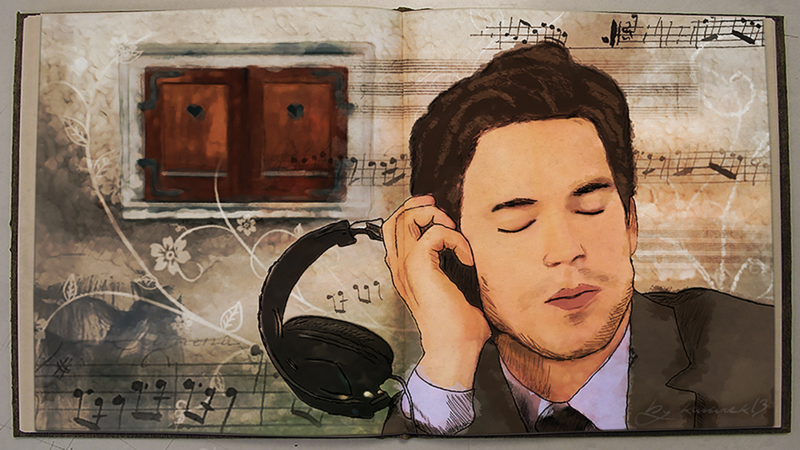 I think it looks a lot like Neal, and he loves music, so it works out beautifully. Thanks for sharing! Neal with Peter's lips, could it BE more perfect?! I love your artwork. Don't sell yourself short. You are most certainly very talented.